Overview... a ham-fisted fish tank cleaner who has never had much success with women. When Deuce learns that one of his clients, a handsome Argentinian named Antoine, is a prostitute, he writhes with jealousy. After severely damaging Antoine’s fish tank and bachelor pad, Deuce decides to try his hand as a gigolo in order to earn the repair money. Personality... clumsy and stupid, yet kind. Deuce is not your average gigolo – he doesn’t usually sleep with his clients, who tend to have some sort of deformity or disability. Rather, he simply spends time with them in order to make them feel better about themselves. Deuce Bigalow's popularity ranking on CharacTour is #3638 out of 5,000+ characters. See our top-ranked characters and read their profiles. Deuce Bigalow goes to Amsterdam after a little accident including two irritating kids and a bunch of aggressive dolphins. There he meets up with his old friend T.J. Hicks. But a mysterious killer starts killing some of Amsterdam's finest gigolos and T.J. is mistaken for the extremely gay murderer. Deuce must enter the gigolo industry again to find the real murderer and clear T.J.'s name. 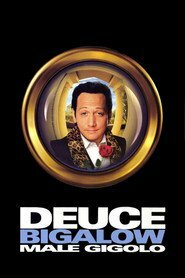 Deuce Bigalow is a less than attractive, down on his luck aquarium cleaner. One day he wrecks the house of a gigolo and needs quick money to repair it. The only way he can make it is to become a gigolo himself, taking on an unusual mix of female clients. He encounters a couple of problems, though. He falls in love with one of his unusual clients, and a sleazy police officer is hot on his trail.